This is our third Special Edition produced in the same concept as Pansies & Parasols and Victorian Roses Collections. Border, joining and corner designs. 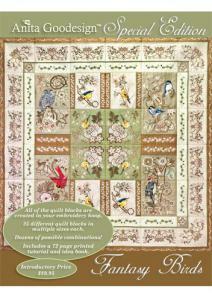 Fully stitched assortment of beautiful bird designs and arrangements. Blank blocks, individual designs and more! Create and learn to make multiple projects with the printed full color photo tutorial booklet included with your Special Edition Collection.